Our chickens are quite the delightful bunch. They live in a chicken tractor, a moveable home that allows them to graze new pasture every few days. 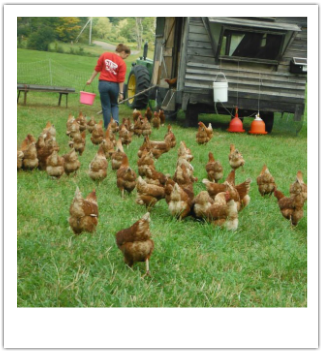 These chickens eat grass, bugs, and any other treats they find on our pastures. Their healthy diet is what makes their egg yolks so sunny! Unlike store-bought eggs, our pastured eggs have beautiful, bright orange yolks. These eggs look and taste better than anything you can find in the grocery store. Plus, their freshness is unparalleled. We offer both Certified Organic as well as Non-GMO eggs.